Imagine, a tablet display you can fold up and put in your pocket, a smart watch whose strap is the screen, or a handbag that is also a monitor and keyboard. Nokia originally called this proposed technology "Morph" back in 2008 because of the plethora of applications it would make possible. Now it looks like it will become a reality. After nearly two decades of work, Samsung is rumoured to be getting ready for the launch of the first flexible smartphone. The company's head of mobile recently said it was "time to deliver" such a phone, and that the development process for it was "nearly concluded". But perhaps more significantly, the Samsung Display division of the company recently said it had developed an "unbreakable smartphone panel" that had passed rigorous safety testing. Even after being subjected to temperatures of 71˚C and -32˚C, and dropped from a height of 1.8 metres, the display showed no signs of damage and functioned normally. This display is a flexible organic light emitting diode (OLED) panel made of an unbreakable surface with a plastic overlay window attached to it, making it simultaneously lightweight and tough as glass but a lot more robust. Manufacturers have yearned for many years to make displays with flexible, bendable properties and a paper-like feel with electronic functionality. If Samsung has truly found a way to protect a flexible OLED then it has solved a major technical challenge in removing the need for the glass screens used on most other displays today. Glass was originally needed to actually stop displays from bending. Old-fashioned liquid crystal displays easily distorted when bent because the molecules in the liquid inside them would become misaligned. Today's OLED screens are based on a solid layer of light-emitting material that doesn't easily distort in this way. But glass is also used to protect the organic molecules in an OLED display from being degraded by water vapour and other gases that would shorten their lifespan. 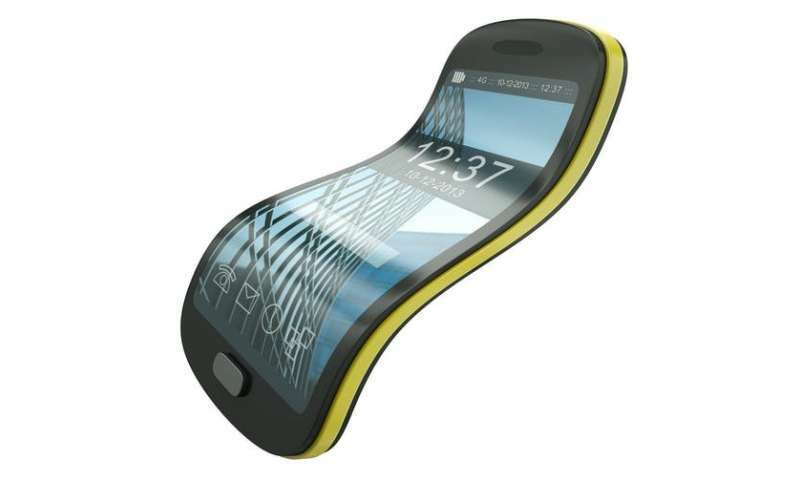 Until now, encapsulating displays in flexible plastic hasn't been enough to protect them. A more advanced, better quality kind of screen known as a quantum dot light emitting diode (QLED) display can also be made flexible. These use nano-crystals to produce high-quality, pure and sharp monochromatic light. They convert the backlight into the pure basic colours without the use of filters. But encapsulating QLED displays is even harder than OLEDs and so are likely to take a lot longer to turn into a flexible product. 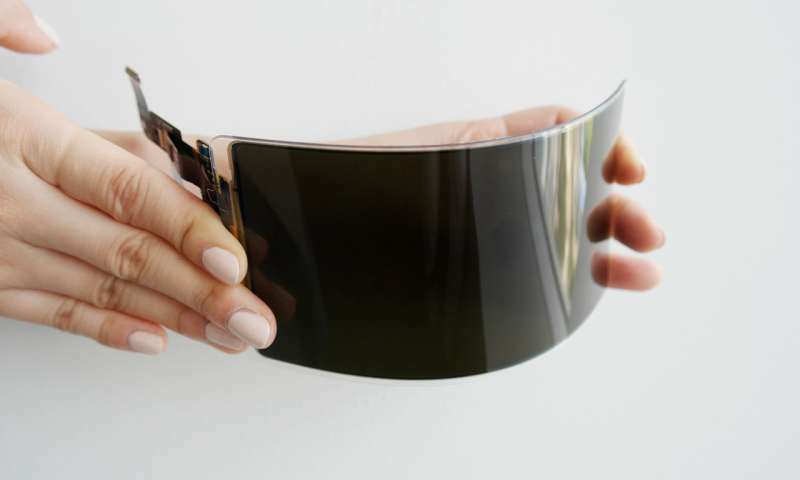 Samsung's flexible OLED screen is likely to be have the most basic level of flexibility, with the ability to be bent and curved without distorting the display but not completely folded. The level of flexibility might be increased as the nanotechnology in the screens improves, as the nanowires used to carry electricity through the displays become more flexible at smaller diametres. In the future we may eventually see rollable displays that can be rolled up like a scroll. The most advanced type of flexible screen will be one that can be folded or even crushed like a sheet of paper and still produce a seamless image. The newest and most exciting idea for creating these screens is to use new "auxtetic" materials, which become thicker as they are stretched rather than thinner. These materials can absorb high energy impacts and are made of single molecules or crystals that can self-align once distorted. They are typically lightweight and would allow the creations of screens with hinge-like design features that can flex significantly. In the meantime, appears that within a year we could be able to snuggle up in bed reading from a screen that we don't have to worry about damaging if we fall asleep on it. I, for one, can't wait to get my hands on this new tech. Don't put it in your pocket with your keys.